For other uses, see Exquisite corpse (disambiguation). Exquisite corpse, also known as exquisite cadaver (from the original French term cadavre exquis), is a method by which a collection of words or images is collectively assembled. Each collaborator adds to a composition in sequence, either by following a rule (e.g. "The adjective noun adverb verb the adjective noun." as in "The green duck sweetly sang the dreadful dirge.") or by being allowed to see only the end of what the previous person contributed. This technique was invented by surrealists and is similar to an old parlour game called Consequences in which players write in turn on a sheet of paper, fold it to conceal part of the writing, and then pass it to the next player for a further contribution. Surrealism principal founder André Breton reported that it started in fun, but became playful and eventually enriching. Breton said the diversion started about 1925, but Pierre Reverdy wrote that it started much earlier, at least as early as 1918. The name is derived from a phrase that resulted when Surrealists first played the game, "Le cadavre exquis boira le vin nouveau." ("The exquisite corpse shall drink the new wine.") André Breton writes that the game developed at the residence of friends in an old house of Montparnasse at 54 rue du Château (no longer existing). These artists started the movement Yves Tanguy, Marcel Duchamp, Jacques Prévert, Benjamin Péret, Pierre Reverdy, and André Breton. Other participants probably included Max Morise, Joan Miró, Man Ray, Simone Collinet, Tristan Tzara, Georges Hugnet, René Char, and Paul and Nusch Éluard. Henry Miller often partook of the game to pass time in French cafés during the 1930s. In a variant now known as picture consequences, instead of sentences, portions of a person were drawn. Later the game was adapted to drawing and collage, producing a result similar to children's books in which the pages were cut into thirds, the top third pages showing the head of a person or animal, the middle third the torso, and the bottom third the legs, with children having the ability to "mix and match" by turning pages. In the context of parties, it can be run as a circle game in which a group of people cooperatively draw a person, taking about 20 minutes to play. An image of a person is drawn in portions, with the paper folded after each portion so that later participants cannot see earlier portions. It has been recommended for use as a tool for teaching about tattoos. Picture consequences can be used to practice vocabulary and to encourage a class to work together. The game is also recommended as a "rainy day" game. The point of the game is the surprise reveal at the end or for simple fun. The person can be drawn in four steps: The head, the torso, the legs and the feet. As a last step, a player may label the drawing, still unseen, with someone's name. The name "picture consequences" is also sometimes used to describe Telephone Pictionary, a game in which players alternate writing descriptions and matching illustrations based on the previous step. The cut-up technique of William S. Burroughs and Brion Gysin was influenced by Surrealism. 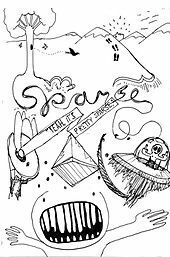 Exquisite Corpse is the name of a literary magazine founded in 1983 (later in online version from 1999) published by Andrei Codrescu. Naked Came the Manatee (Putnam, 1996) is a mystery thriller parody novel. Each of its thirteen chapters was written, in sequence, by a different Florida writer, beginning with Dave Barry and ending with Carl Hiaasen. Exquisite Fruit is a variant conceived by members of the National Puzzlers' League in which a round of trivia questions are sequentially written by players, given an answer provided by each player at the start, and the resulting question posed to another player at the end. The Narrative Corpse (Gates of Heck, 1995) is a comic book chain-story by 69 all-star cartoonists co-edited by Art Spiegelman and R. Sikoryak. Apichatpong Weerasethakul's 2000 film Mysterious Object at Noon uses this technique with a mixture of documentary and fictional film. The Exquisite Corpse Project is a 2012 feature-length comedy film written using the exquisite corpse technique. A Rick and Morty 2017 trailer for season 3 is titled "Exquisite Corpse" and features a multiple minute long sequence to the song "Thursday in the Danger Room" from the album Run the Jewels 3 by Run the Jewels. Exquisite Corps and And So Say All of Us are choreographic versions by filmmaker Mitchell Rose. The band Bauhaus have a track titled "Exquisite Corpse" on their third studio album (The Sky's Gone Out) (1982), which appears to have been created in this collaborative surrealist style. A song in the musical Hedwig and the Angry Inch (1998) is entitled "Exquisite Corpse". The musician Daedelus named his album Exquisite Corpse (2005). The band Warpaint named their debut EP Exquisite Corpse (2008) because of their collaborative songwriting style. George Watsky's 2016 album, x Infinity, features a song titled "Exquisite Corpse" using this technique featuring verses by several artists. In ...and then we died, players use word fragment tarot cards to form words to tell the story of their collective deaths. ^ a b Breton, André (7 October 1948). "Breton Remembers". ^ Reverdy, Pierre (March 1918). "Morgue". Nord-Sud. Archived from the original on January 7, 2009. Retrieved 28 March 2009. ^ Breton, André (7 October 1948), Le Cadavre Exquis: Son Exaltation, exhibition catalogue, La Dragonne, Galerie Nina Dausset, Paris (October 7–30). ^ Brotchie, Alastair; Mel Gooding (1991). Surrealist Games. London: Redstone Press. pp. 143–144. ISBN 1-870003-21-7. ^ "The Exquisite Corpse". Poetry Plus. 2009. Retrieved 28 March 2009. ^ a b Budden, Joanna (2004-04-11). "Circle games". Teaching English. British Council/BBC. Archived from the original on 2008-09-25. Retrieved 2008-09-24. ^ a b c "Rainy days survival guide". The Independent. 2007-06-01. Retrieved 2008-09-24. ^ a b Budden, Jo. "Essential UK – Tattoos". British Council. Archived from the original on 2008-09-25. Retrieved 2008-09-24. ^ a b Bounford, Trevor (2003). Family and Party Games. HarperCollins. p. 100. ISBN 978-0-06-053456-1. ^ Newby, Peter (1995). The Giant Book of Word Games: The Bumper Book of Ingenious and Enjoyable Games for all Occasions. The Book Company. pp. 42–43. ISBN 1-86309-172-6. ^ "To Better Know that Death | Unwinnable". Retrieved 2019-01-04. This page was last edited on 12 April 2019, at 16:02 (UTC).